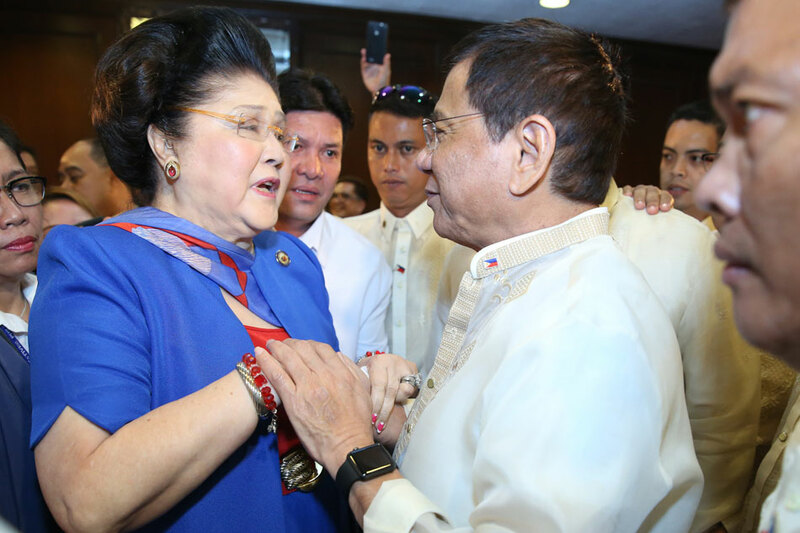 MANILA- President Rodrigo Duterte will not interfere in the graft conviction of former First Lady and Ilocos Norte Rep. Imelda Marcos, his spokesperson said Friday. Marcos was found guilty of 7 counts of graft by the Sandiganbayan for using her Cabinet position to maintain Swiss bank accounts during her late husband Ferdinand Marcos' reign. She was sentenced to imprisonment of 6 years and a month to 11 years for each of the 7 counts, with perpetual disqualification from public office. Speaking to ANC, Presidential Spokesperson Salvador Panelo maintained that Duterte respects the rule of law. "The President repeatedly has said we respect the rule of law. We will not interfere with the judiciary. And consistent with that, any violator of the law will be prosecuted fully until the end," Panelo said. "This President does not recognize relationships, alliances, friendships with respect to violations of the law. He always adheres to the principles that if you violate the law, whoever you are, you'll have to answer for that," he added. Panelo, however, noted that Mrs. Marcos' conviction is not yet final, and that the Palace will wait for the final decision from the Supreme Court. Duterte has made no secret his admiration for the late dictator, a friend of his father, Vicente, who served in Marcos' Cabinet. In November 2016, Duterte allowed the late strongman's burial at the Libingan ng mga Bayani in rites held away from public eye. He has also said in case of his demise, he would prefer the late dictator's son and namesake, Ferdinand "Bongbong" Marcos Jr., to be his replacement for the presidency instead of his constitutional successor, Vice President Leni Robredo. Panelo explained that the conviction of the Marcos matriarch shows that no one is above the law. "The lesson there is regardless of whether you're powerful or not, if you violate the law, it will catch up on you," he said. "It doesn't matter whether you're up there in the highest pedestal of political power or not -- you violate, and the court rules you did violate, and you will have to be punished. That's the lesson for all," he added.